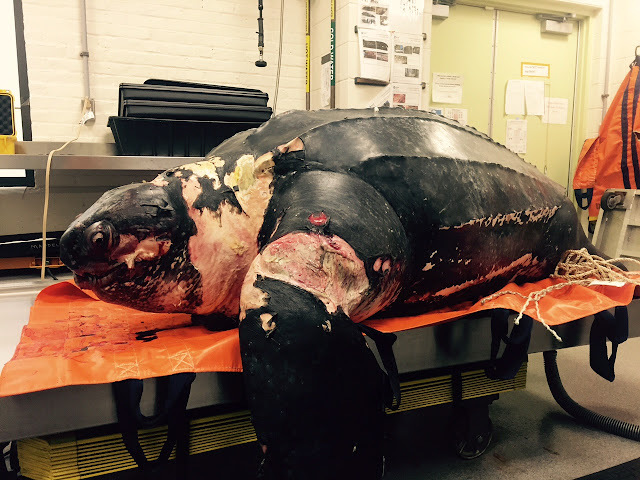 On Sunday, New England Aquarium biologists and head veterinarian, Dr. Charles Innis, conducted a necropsy on an 813-pound leatherback sea turtle that was found floating Saturday about one mile south of Woods Hole. The necropsy results showed abrasions and tissue tearing on the left front flipper and around the neck that are consistent with entanglement with marine gear. The adult female, which was over 6 feet in length, also had a two foot section of marine rope in her mouth. She appeared to have been dead for at least two to three days. She also had tags that had probably been fastened on her when she had nested on an eastern Caribbean beach. That exact location should be learned Monday. On Saturday, while the dead leatherback on the southwestern corner of Cape Cod was being towed to land by a Massachusetts Environmental Police vessel, marine animal rescue experts from the Center for Coastal Studies were busy successfully disentangling a slightly smaller, live leatherback off the northeast side of the Cape in Pamet Harbor in Truro. Click here for more details. Leatherback sea turtles migrate to New England each summer to feed on the abundant sea jellies found in offshore waters, but these endangered animals also often become entangled in the gauntlet of vertical lines that extend from surface buoys to boat moorings, lobster pots and other fixed fishing gear. In the plankton rich, darkened waters of the region, the leatherback’s enormous 2-3 foot front flippers can come into unexpected contact with a fixed line that then spins the animal, which often results in a wrap of rope around the flipper or the head. Being a reptile and an air-breather, the leatherback must occasionally reach the water’s surface to survive. These enormously strong swimmers can sometimes haul a huge amount of weight to the surface trying to survive. Unless discovered by boaters or blessed with enormous luck, these sea turtles eventually tire and drown. On Saturday, the good and bad results of this all too common struggle were apparent on the same day on opposite sides of Cape Cod. Both of these leatherbacks were at the tail end of the leatherback migration out of the Gulf of Maine, past the Cape and the Islands and down the eastern seaboard to tropical waters for the winter. With local ocean temperatures in the low to mid 50’s, leatherbacks are unique among sea turtles in that they are able to raise their body temperatures above the surrounding water temperatures and remain active. 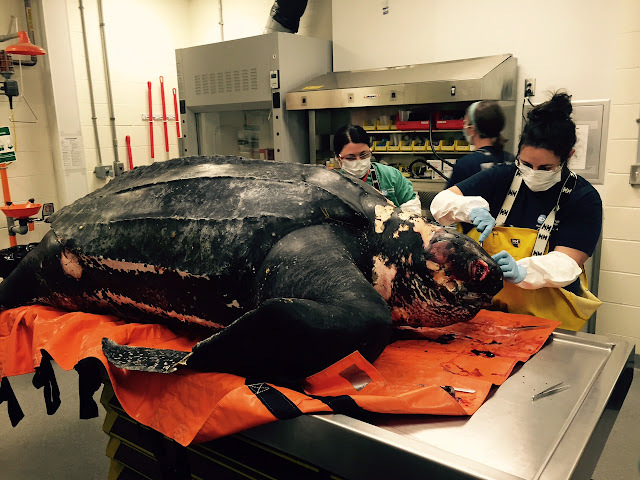 The turtle autopsied by the Aquarium is just average sized for adults of this endangered species. At over 800 pounds, the turtle autopsied by the Aquarium is just average sized for adults of this endangered species! Leatherbacks are the largest turtle and one of the largest reptiles in the world. These giant, black, soft-shelled leatherbacks appear to be prehistoric, and that is because they are. They have survived the disappearance of the dinosaurs, cataclysmic climatic events and the Ice Age, but they may not survive the Anthropocene – the very short window that humans have dominated the Earth. Further research on turtle sight and technical modifications to marine gear might help leatherback populations recover. Keep reading to learn more about leatherback rescues by the New England Aquarium.